Preheat oven to 400 degrees. Line baking sheet with silpat or parchment paper. On a large work surface, lightly dusted with flour to prevent sticking, unfold pastry sheet. Roll dough with a rolling pin so that the dough is even and smooth. Shape the dough into a 10-inch (approx.) square shape. Cover dough with half the grated gruyere, half the basil, then the salt and pepper. Lay 4 prosciutto slices lengthwise so that they are covering the pastry dough. Top prosciutto with half the gruyere bits. Fold in the two opposite sides of the square so that the sides meet in the center. Once again, fold in the same opposite sides of the pastry to meet in the center (you will have a long, vertical rectangle that looks like a heart-shape if you curved the edges). Fold one half of the pastry over the other, so that it resembles a tight vertical cylinder. Using large, sharp scissors or a serrated knife, carefully cut pastry crosswise into 1/2-inch slices, making sure to keep the pretzel-like shape. You can squeeze them together if they seem to unravel. Arrange palmiers on the baking sheet, 2 inches apart, cut side down. Repeat assembly steps with remaining pastry sheet and ingredients. Bake in the middle of the oven for about 12 minutes (10 if using convection). Turn over and bake an additional 5-7 minutes. Cool and transfer to serving platter! Note: A palmier is a similar shape to a pretzel so when you're figuring out how to fold it, think of that! 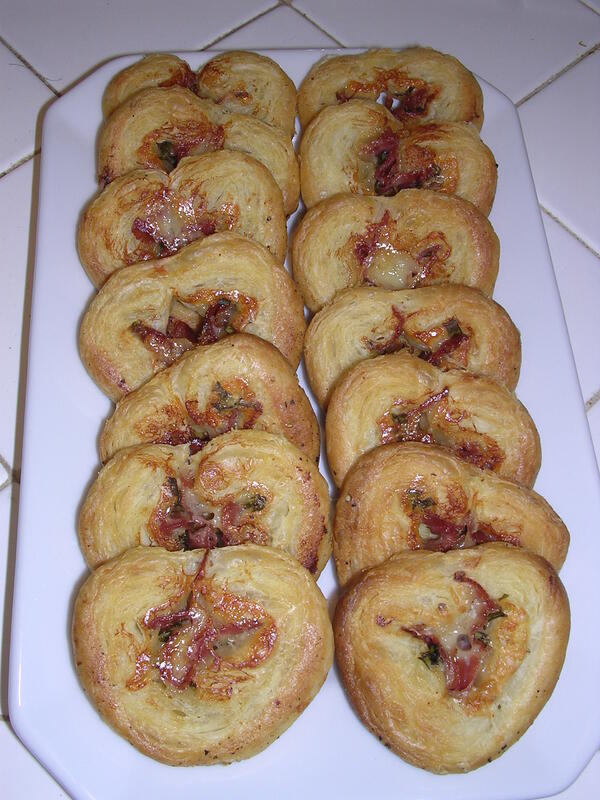 These are a fancy, easy little appetizer that goes great with champagne!